HARLINGEN — Hello … winter? 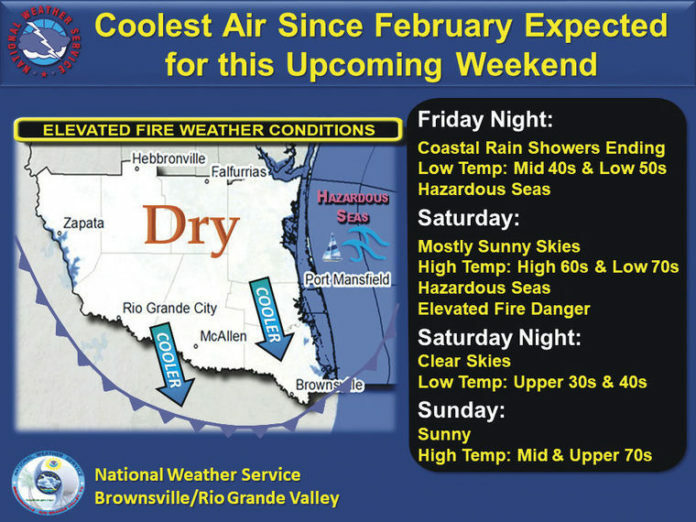 A robust cold front gearing up to rumble through the Rio Grande Valley on Friday will bring the coolest temperatures to South Texas since February. So break out the flannel sheets and the quilts, because overnight temperatures will drop into the 40s. In some rural areas of the ranchlands, lows could possibly fall into the upper 30s early Sunday morning, although no freezing temperatures are in the cards. “We’ve finally shifted away from the summertime heat, and we hit record high temperatures well into October, but this is basically a very strong cold front that’s coming out of central and western Canada and it’s heading our way,” said Tim Speece, a meteorologist with the National Weather Service in Brownsville. “It will be bringing a very chilly weekend for us here,” he said yesterday. Like the last cold front that blew threw the Valley, this one won’t be dragging a lot of rain with it. Along with the temperatures, the humidity will also plummet with the front. An elevated risk of wildfires could be declared, depending on the moisture content of flammable fuels in the woods and fields. Forecasters in Brownsville say boaters in the Laguna Madre and in nearshore gulf waters need to be on alert this weekend, as hazardous marine conditions are expected to follow the front. Despite the chilly overnight temperatures, the rest of the weekend should be sunny and pleasant.